The contest is the first of a series of planned APD fundraising events designed to focus public attention on different health issues. Upcoming issues will include children’s cancers and autism. This inaugural event focused on men’s health issues in a fun way, with HollyFrontier Corporation as the sponsor. 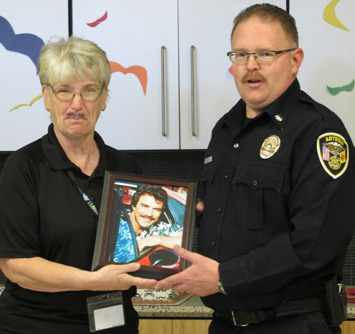 Contestants were judged by surprise judge Snidely Whiplash (aka Sandi Farley, City of Artesia Human Resources director) in two categories: Best Overall and Most Tom Selleck-Like. After a short parade and much pondering, Snidely awarded the Best Overall prize to Cmdr. Lindell Smith, “because I’m always partial to redheads.” The Most Tom Selleck-Like award was determined by monetary donations, and the prize went to an unexpected entrant: Becky Mathews, prosecuting attorney liaison. Becky later ‘fessed up to using a mascara brush to produce her winning moustache. A reception was held after the judging, with cake and drinks — it was difficult to determine which entrant got the most frosting in his/her mustache, but it was certainly delicious! All donations and entry fees will be donated directly to the American Cancer Society. The APD will be collecting additional donations through Christmas Day, and anyone wishing to contribute can do so at the Records Department during normal business hours or by contacting Smith at 746-5000.